When someone writes a blog post or writes a tweet which is harmful or damaging or ignorant or racist or rude how about we exhaust them with love, peace, grace and hope? How about we refuse to engage in a heated battle of words and instead just wear them down so much with hope? The thing about most bullies is that they’ve never experienced that kind of response before. All they’re used to is others making them feel small in return and that, even if they are unaware of it only makes them more angry themselves. It doesn’t heal and it doesn’t bring life. To anyone. Back to the person I re followed. I didn’t name him before because I didn’t want people’s biases against him to distract from the point I was trying to make. But I will name Jamie Bryson here because it’s important for my social media experiment. Every time Jamie writes something that is just plain wrong and fails to see the nuances of people who are different than he is, I’m going to point out their words could be damaging sure but I’m going to respond with hope and desire to see them let go of the hate they obviously carry. I’m not just going to let what he says that is wrong slide, but encourage him with words that he is better than that. I’m going to encourage Jamie to see the bigger picture. I’m going to offer a way of speaking about his enemies that perhaps he hasn’t even thought before. There is not going to be anywhere for Jamie to hide from a uniquely hopeful response. I’m going to respond to hate with hope. I’m going to response to anger with peace. Will Jamie suddenly see that there is a better way, that will only make him feel alive and see a future that he couldn’t even imagine before? Because that’s not the point. The point is that he will not simply face a barrage of hate that he is used to. He is going to experience love and peace from me and if it’s only me then that’s ok. I won’t stop. However, what if it wasn’t only me? What if all of us who disagree with Jamie or (fill blank of the person you love to hate on social media) left messages for them that made them sit up and actively work towards peace, instead of growing in anger? So who’s with me? 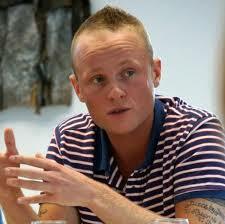 You can follow Jamie on twitter here and use the hashtag #LoveforJamieBryson in your tweets to him. Let’s inundate his feed with positivity instead of the negativity that he is so used to hearing. Perhaps then we’ll see progress beyond pointless bickering online. But if nothing else, it will free you and I from the hate and anger that almost got me. I really like this, Paul. Loving your enemy in action. Bravo. I hope this becomes a trend.